The most common initial SEO strategy is to follow best practices for building user-friendly, well-formed websites. Optimizing your content and HTML, using good web page titles and generating links to your website are all ways you can help search engines such as Google, Yahoo! and Bing index your site better and more accurately. However, because of an updated Google search ranking algorithm (dubbed “Panda”) — which aims to reduce the efficacy of content farms with shallow content that often have artificially inflated backlinks and black hat search engine optimized content — the status quo has drastically shifted. Google, along with other search engines, has gotten smarter and now includes social signals as a top ranking factor. In order to succeed in this new search engine landscape, we must therefore look beyond our own website. In this article, I’ll share some tips for using social media to help with SEO. The fundamental idea I want to convey is that these tips are good practices to begin with and, when applied correctly, will stand hand-in-hand with your social media engagement efforts. Just like with any successful search engine optimization plan, when you put your users’ interest first, good search engine rankings often follows. Google has made it clear that social signals are now an important part of SEO. I like breaking down social signals into two main categories: Virality and Social Media Presence. Virality is when your content has a strong reach in the social media realm. Websites like TechCrunch, Mashable and The Oatmeal have strong virality because the content they publish — breaking news, controversial topics and humor — is sharable and well liked by social media users. These sites also have strong communities and loyal followers who are vocal and who love to share content. Social signals defined in this category are thus a mode of voting. Each retweet, Facebook Like, Google +1, Digg upvote and so on can help search engines distinguish which links their users will likely prefer over another. If your site is just starting out and hasn’t garnered a large base of fans yet, it will be an uphill battle to rank well with virality. However, creating and actively maintaining a presence in social media has proven to increase the authority of your website in the eyes of search engines. You don’t have to produce viral content on a regular basis, but if your Facebook Page gets comments and your Twitter account gets mentions, then it’s good for your site. If you’ve neglected social media as part of your site-growing strategy, SEO is a reason for you to start paying attention to it. Let’s talk about some strategies and tips for optimizing your site through social media. Being the most popular right now, the obvious social media sites that we should talk about are Twitter and Facebook, so let’s begin there. Google looks at specific elements from Twitter and Facebook to use as ranking signals, as discussed by Google’s head of webspam team, Matt Cutts, in this video. For Twitter, Google looks into a Twitter profile’s biographical data such as links it mentions, its geographic location and the number of tweets, mentions and retweets it has. The more a Twitter account is mentioned, the more authority Google will give it. Thus, a Twitter account with more authority tweeting about a web page on your site could have a bigger impact on your search engine rankings than one that doesn’t have as much authority. Another important ranking factor is the keywords that surround a link contained in a tweet. 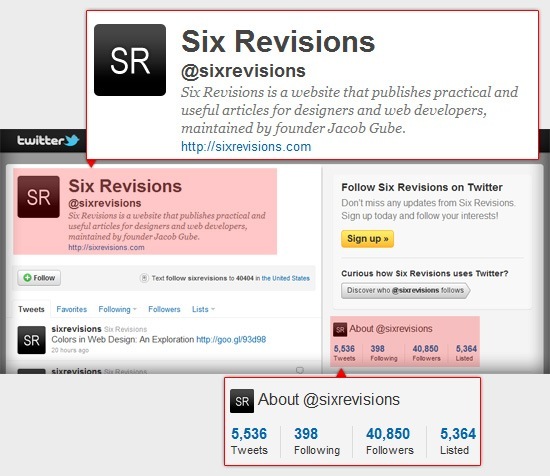 For instance, SEOmoz, a highly-regarded SEO blog, reported an unexpected Twitter case study a while back that showed a single tweet being able to help generate a fourth spot Google ranking as well as 160 unique visits. 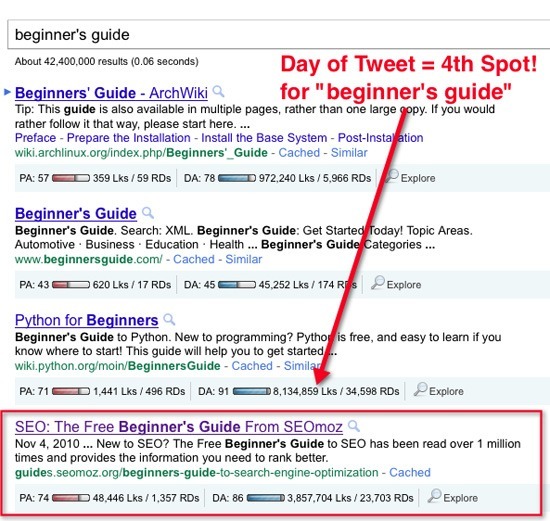 Because the tweet contained the words, “Beginers Guide”, even in its misspelled form, a Google search query of “beginner’s guide” ranked the post it was linking to in the first page of the search engine results on the day the tweet was made. Facebook optimization is very similar to optimizing a regular website. Content should have SEO-friendly titles and text when being posted to a Facebook Page. In terms of Bing, which has some different SEO requirements, the number of Facebook Likes and Facebook shares help organic rankings, as highlighted in a post on TechCrunch by Erick Schonfeld. In the post, Schonfeld says that Facebook could soon look at social signals to “identify experts related to various searches,” including those who aren’t part of your friend’s list. Another benefit of having a Facebook Page and Twitter account is they take up space on the first page of Google search engine results when a search query mentioning your company is made. This can help replace spam and unrelated web pages that share the same keywords. Aside from Twitter and Facebook, there are other social media web services you can use that you might not necessarily have thought of before. Let’s talk about two of those platforms. The beauty of an About.me page is it acts as a virtual business card. It can hold personal information you want to share with your network and to the public. When a search query is made for a name of the person, the About.me page could be one of the top search results. How does this help a website? In many cases, your staff becomes an extension of your site. A search related to a person connected with your website may generate leads in organic search. 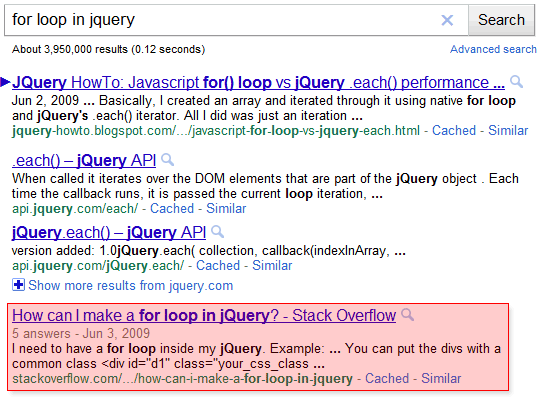 Sites like Stack Overflow and Quora have been on the rise in recent times. They have had positive impacts on businesses because the questions asked on these platforms are starting to rank for competitive keywords. One of the reasons for this is the increasing number of keywords that are questions. For example, phrases like “where can I buy an iphone” and “how to unlock an iphone” are beginning to replace keywords searches such as “buy iphones” and “unlock iphones”. Q&A sites accumulate questions and answers from their community, which is eventually indexed by Google. Where this is interesting for other websites is if they can provide an intuitive answer to a question related to their industry to generate clicks.